As a rosacea sufferer, I love the tricks I have collected over the years for toning down redness. I’m all about instant gratification when it comes to redness. 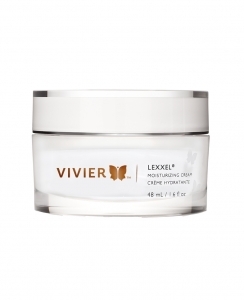 Skincare — we have 2 products that calm redness in 5 minutes, our favourite cleanser Hexam and moisturizer Lexxel. 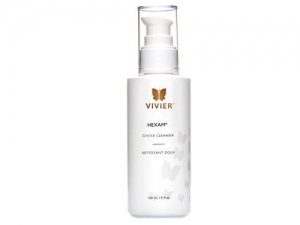 Hexam is so gentle that I can use it to wash off my eye makeup and mascara without hurting my eyes. And it has a light botanical scent that I really like. With continued use of these 2 products, you will find your redness flaring less and less over time so it gives you both immediate and longterm benefits. Foundation/concealer — I always go to a slightly yellower tone than my natural skintone so my skin looks more like peaches and cream than strawberries and cream. In the glo Minerals foundations, it’s super easy to know what colour to choose. Their light-toned foundations are divided into Beige (pink-toned), Natural (pink and yellow are balanced) and Golden (yellow-toned). Within each colour line, there is light, medium and dark. So if you match to Beige Medium, you could go to the Natural Medium or even Golden Medium to tone down redness. The trick is to use a light hand and blend really well. glo Minerals foundations also contain vitamins A, C, E and K and green tea extract so they are naturally calming for the skin. Pressed bases give you the control to go from very sheer to opaque converage, according to your needs. Anti-redness powder — glo Minerals makes a loose yellow powder called Redness Relief Powder that contains honey suckle, zinc oxide and caffeine. Honey suckle calms irritation. Zinc oxide has sun protective properties. Caffeine makes the superficial blood vessels constrict so they are smaller and less visible than normal. And the yellow colour counters the strawberries in my skintone to look more peachy. 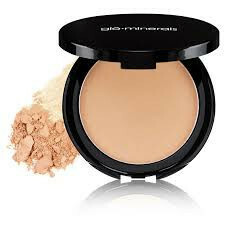 You can use Redness Relief Powder with your regular foundation or on it’s own. People can see the anti-redness effects as soon as I apply it on their skin so it’s another instant gratification product. I have used Redness Relief Powder on my male clients as well. 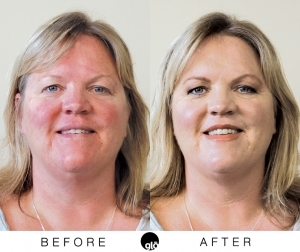 It doesn’t look like makeup after it’s applied so it is a great way for a man to have immediate control of his redness. Don’t let redness get you down. Use my favourite tricks to reduce redness quickly and easily.